As Lonely Planet puts it, Norway is the last refuge for some of Europe’s most intriguing wildlife. In the pre-internet days some tourists hoped they would be able to see polar bears walking the streets. As a matter of fact, they can only be spotted in Svalbard, but you may stumble upon moose, reindeer, or a white-tailed eagle’s nest on your own trips into the Norwegian wilderness. If you prefer an organized trip, you could join a wildlife safari. These animal safaris will bring you near creatures such as whales, the long-haired musk oxen, or the king crabs near the Russian border. Several protected islands are excellent destinations for birdwatchers, like the Vega archipelago in Northern Norway or Runde in the west. Whales. These giants of the ocean visit the Norwegian coast every year, showing off for tourists and locals alike. In Norway, they are most commonly found along the Vesterålen coast in the summertime. The most common whale to spot during the summer season is the sperm whale, but if you are lucky you may also see pilot whales, minke whales, humpbacks, dolphins, and killer whales. By joining a whale safari, you will also be able to enjoy a magnificent scenery, lots of fresh sea air, and natural surroundings guaranteed to make a lasting impression. Dovrefjell-Sunndalsfjella national park is the only place in Norway, and one of the few places on earth, where you can see the mighty musk oxen. From June to September, you can join a guided summer walking safari, and guests are virtually guaranteed an encounter with these unkempt, half-ton beasts. The musk ox may seem big and clumsy, weighing between 225 and 400 kilos, but it moves fast with a top speed of 60 kilometres per hour. The musk ox may seem big and clumsy, weighing between 500 and 900 pounds, but it moves fast with a top speed of 37 miles per hour. 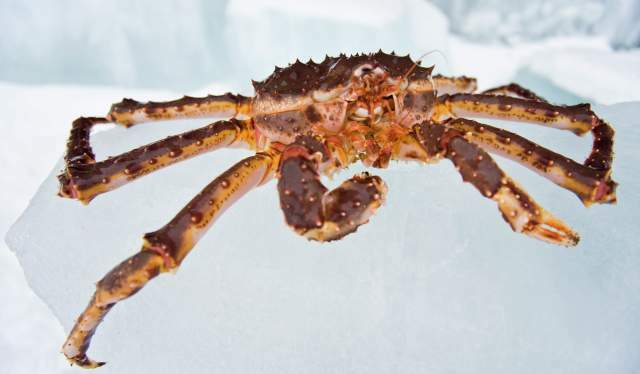 Come face to face with the red king crab in the Barents Sea off the coast of Finnmark. Afterwards, you can have a taste of the succulent meat. as it is brought to the surface and put into the boiling pot. The red king crab can measure up to two metres from claw to claw and weigh up to 15 kilograms. as it is brought to the surface and put into the boiling pot. The red king crab can measure up to six feet from claw to claw and weigh up to 33 pounds. The meal that follows the safari is an absolute feast: tasty pieces of crab meat on white bread, home-made dressing, and, for those who desire, white wine. Mountain areas like Dovrefjell and Rondane, the Trondheimsfjord, the islands of Vega and Runde, Lierne and Børgefjell, Pasvik and the Varangerfjord are just some of the Norwegian destinations that are world-renowned for birdwatching. In the west you’ll get the chance to see divers (gaviiformes) and grebes (podicipedformes) as well as wildfowl (anseriformes) and waders (charadriiformes). In the mountain habitats you can find species such as dotterel (charadrius morinellus), red-necked phalarope (phalaropus lobatus), horned lark (eremophila alpestris), bluethroat (luscinia svecica), Lapland bunting (calcarius lapponicus), snow bunting (plectrophenax nivalis) and if you are lucky, you might spot a snowy owl (bubo scandiacus). In Finnmark you may see true Arctic species such as steller’s eider (polysticta stelleri), king eider (somateria spectabilis), brünnich’s guillemot (uria lomvia) and red-throated pipit (anthus cervinus). Northern Norway has the biggest population in Europe of white-tailed eagles. From here, the species has spread to most of the Norwegian coastline, and eagles from Norway have even been brought over to help repopulate Scotland with the majestic birds. If you’re hoping for a close encounter with the king of the forest, you go on a guided moose safari. Maybe you want to spot moose in the twilight from an electric bike? Guided excursion to see the moose, king of the forest. Personal Guide only for you when you want it. Guided excursion to see the moose, king of the forest.